Edvian is the brainchild of two musicians that happen to be brothers: Andrew and Victor Plitkinyh. The band was born in 2009 in Tver city (Russia) and selected the direction of progressive metal. In 2011 band recorded 4-tracks demo with already completed line-up and then began an active concert activity and work on a full-length album. In 2012 recording of the debut album was finished and the band was able to sign a contract for the release of the CD with the Ukrainian label Total Metal Records. 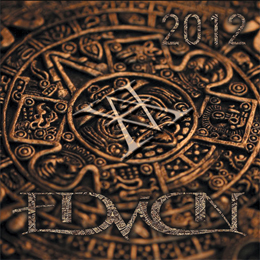 The album under the name “2012” was released at December 20, 2012. Well to be fair, it isn’t progressive metal as they imply. Its more rock oriented with here and there some industrial touches. And I’m not going to say that it is a bad record, but I certainly don’t like it. The songs just don’t sound interesting and appealing. It’s not something specific, but yeah the entire album is just not something I would buy or even listen to.